If you are looking for a unique mountain getaway experience, you have found it! This is the place where family quality time, fun and memories will be made. This well maintained 4200 square foot, 3 level, custom log home will meet and exceed your expectations for a mountain vacation. This is our 6th season of offering the premier vacation destination in the Asheville/Black Mountain area. This home is set up perfectly for 2 families or multiple couples to vacation together. There are two king master bedroom suites on levels two and three. Each master suite has a large jacuzzi tub, double granite sinks, and a walk in shower. Bedroom 3 (the bear room) on the upper level can be a third master suite with a queen bed and a twin bed with a full bathroom with a tub and two sinks. Bedroom 4 on the lower level has a queen bed, a sofa and one twin bed. Bedroom 5 (the bunk room) on the lower level has a bunkbed and a trundle bed. This bunk room has one full and 2 twin beds and is perfect for the kiddos. The home can accommodate 13 comfortably in beds. There are 6 TV's in the house connected to DISH satellite. All the bedrooms (except the bunk room) as well as the great room and the game room have TV's. The wifi internet is through the satellite and is fine for web surfing and checking emails. Much of the house cabin decor was acquired locally in Black Mountain and Asheville. The property is very quiet, peaceful and private and sits on 2 acres with breathtaking views all around. The deck wraps around with plenty of seating and relaxing in the hammock and swing chairs. There is a large back deck for entertaining with a hot tub, BBQ, table with seating for 6, cozy outdoor furniture and even a fire pit. Behind the deck, there are stairs leading up to swing chair to enjoy those amazing long range mountain views. The amazing outdoor spaces are the place for relaxing and enjoying the mountain views and listening to the sounds of nature. We have an orchid of fruit trees planted on the side of the house including peach, apple, plum, cherry and blackberry. When in season, enjoy blackberry and peach picking right on the property. Why the Owner Chose Black Mountain: After living in South Florida for 20 years, we searched for an escape up in the mountains. 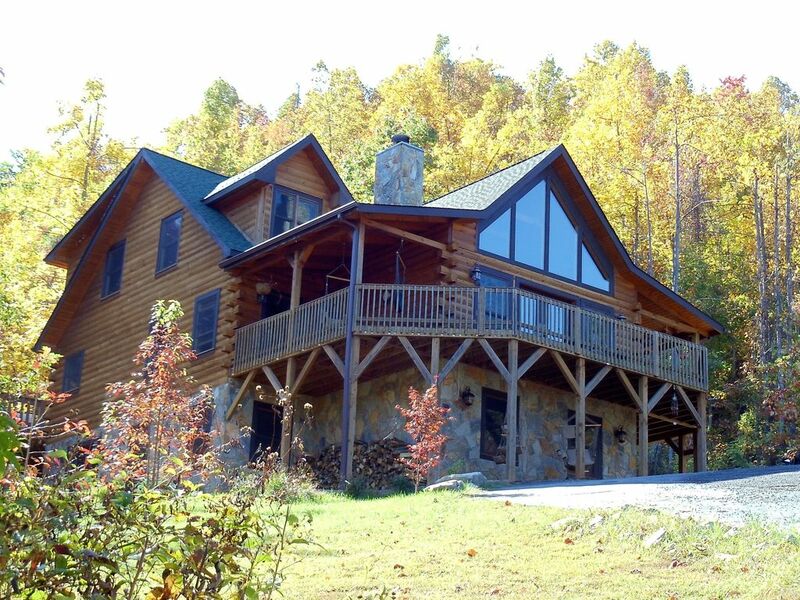 We designed and built this custom log home in 2007 and vacationed in it for 2 years. We enjoyed this incredible lifestyle so much that we decided in to move to Asheville in the summer of 2009. We briefly lived at the lodge and really enjoyed it. We have since opened a medical office in Asheville and need to be close to the practice as well as the kid's school. That is the reason we have now decided to offer this incredible property for others to enjoy. We know you will love this property and the breathtaking mountains as much as we do! 2 towels per guest will be provided in each bathroom as well as a few beach towels in the laundry room for the hot tub. Perched up on 2 acres, the property offers nice short and long distance views all around. All beds will be made up prior to your arrival. Wood burning fireplace use permitted Oct - April only. Flat parking at top of driveway for 4-5 cars. 2 towels per guest is provided plus a few extra beach towels for the hot tub. For family and friends gatherings: Large Maitland Smith wood inlay dining room table with seating for 8-10 comfortably. Every bedroom except bunk room has a TV. There is also a TV in the great room and the game room. DISH Network with most sports channels included. Bluetooth Harmon Kardon speaker in the kitchen and game room where you can connect your bluetooth device. Large assortment of books on the book shelf in the lower level hallway. Pool Table, Ping Pong, Hand Shuffleboard, Arcade Games, Wet Bar and TV. Various board games in the house. 2 large decks in the front and back of the house with mountain views and plenty of seating. Relax in the hammock swings. 6 person Hot Tub on back deck. Free long distance to the continental US provided with the land line phone. If you have a Verizon cell phone, you will get a clear signal. Other carriers may work but could be spotty. We also provide wifi internet access. If you wish to use internet, bring your wireless devices. We have satellite internet as there is no DSL on the mountain. It is sufficient for surfing internet and checking email. Full game room including pool, ping pong, shuffleboard, arcade games, TV, and pub style wet bar. There is a Hot Tub on the back deck. There is plenty of outdoor seating, hammock, swing chairs and rocking chairs and both decks. There are also 2 swings and 2 hammock chairs underneath the front deck. We had a fabulous time in this magnificent home. The house easily accommodated our group of ten. We enjoyed the peace and solitude every morning while admiring the view from the deck. The kids loved the game room and all the activities it offers. Every night, we all took advantage of the hot tub as we recounted the adventures we shared that day. Black mountain is a cute town that had plenty of restaurants and Asheville was a quick drive. We appreciated the welcome note and bottle of wine upon our check in. Thank you for sharing your beautiful home with us! We are so happy you enjoyed our log home and had such a nice stay. Thank you for your wonderful review. We really enjoyed our stay at the beautiful Catawba Falls Lodge. The personal touches in the cabin made it feel very comfortable. The flowers and wine were so appreciated. Michael went out of his way to ensure we had a good internet connection as my husband had to work during our stay. He enjoyed the upstairs desk with the beautiful view! The kitchen is excellently stocked. Everyone enjoyed the game room. Views are wonderful. Very comfortable cabin and great visit. Thank you! Beautiful, tons of space, unbelievable location. A group of friends and I stayed here for a weekend reunion. Everything was in order and exactly how it was in the photos. What you don’t see in the photos is how truly gorgeous the mountains are around the property. The multiple deck areas are great for lots of people to gather, talk, and enjoy the view. The rooms are spacious and provide plenty of room for lots of people to sleep. By far the best rental property experience I’ve ever had. Thanks Michael! What a great review! Thank you and we are thrilled you and your friends had such a nice stay at our mountain paradise. Thank you for taking the time to leave such a nice and detailed review of our log home. We are grateful and glad you had such a nice family mountain vacation. Hope you visit again! We are located 15 minutes (8 miles) from downtown Black Mountain and 30 minutes from Asheville. There is a large grocery store as well as other shopping 6 miles from the community in Black Mountain. Golf: There are many golf courses within a 20 - 45 minute drive from the house. Ski: There are 6 ski resorts within a 1-2 hour drive (35 - 80 miles from the home). Check out SkiNorthCarolina.com for further information on ski resorts. We accept American Express, Visa, MasterCard and Discover. Rates are subject to change until reservation is confirmed. Holiday rates and summer apply with a one week minimum for 4th of July, Thanksgiving, Christmas, New Years. There is a 60 day cancellation policy. Any requests for cancellations greater than 60 days before check in will receive 100% refund of the deposit amount minus a $100 cancellation/admin fee.